Industrial themed interior design is stronger than ever and you too can now get this look in your home. 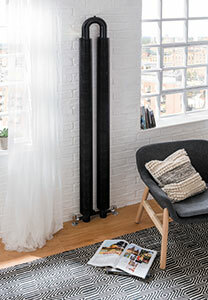 For example, why not tap into this trend with Zeb, a black steel, coil finned radiator that has an innovative design, adding an element of dramatics to a room. However, to achieve a more relaxing and inviting home interior, the Zeb radiator, when coupled with warm neutral tones of grey and beige can take pride of place in your home, creating a warm, comfortable environment that blurs out the stresses from everyday life.